Track, Manage and Generate live reports on the number of skips performed by teams within a stipulated duration. The new Rope Skipping Auto Detection System is possibly the most efficient way to organize group competitions that are Fun, Challenging & Inclusive. 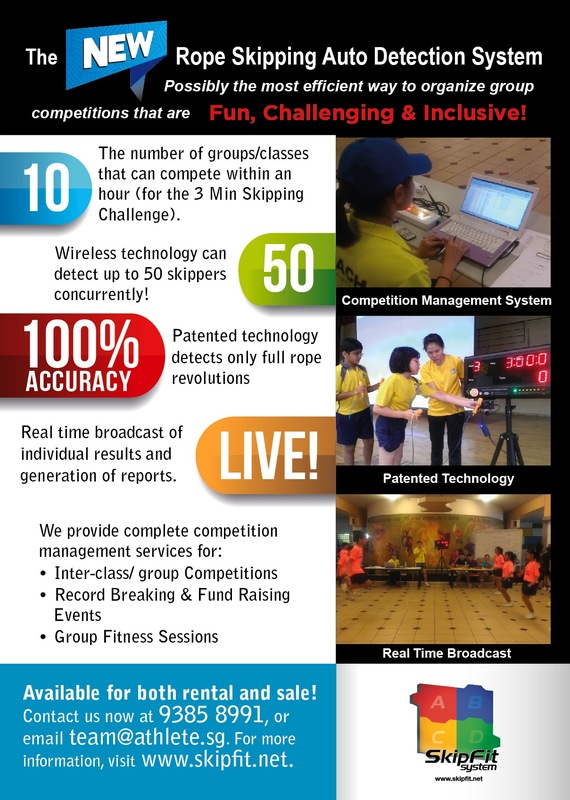 Patented technology allows detection of up to 50 skippers concurrently, and provides real-time broadcast of individual results and generation of individual and team reports. What is the Skipfit 3 Min Challenge ? Call us at 9793 9745, or email hansen@athlete.sg to bring this challenge to your school or organization! Click here to view the current record holders for the SkipFit 3 Min Challenge!